Anton Khduboin has done it again... he's back from injury and is 2-0 since his injury and 4-0 as a Hurricane. His current save percentage is .928... good for 8th in the NHL. Agreed. Let him have a stab. I think he's earned the start. It does wonders for our team not to give the opposing team a free 4 goals every time Ward is in net. This save by Doby at the buzzer to give the Canes the win!!! I wanted to say this after Dobby went 2-0.. I just didn't have anything to back up my beliefs until now. I could live with a Khudobin/Peters combo. Now 5-0 on the season with a career record of 19-5-1. He made 31 saves on 32 shots tonight. Because of Doby, we are only one point out of a playoff spot. With Ward injured, Khudobin has a chance to steal some time away in the second half of the season. 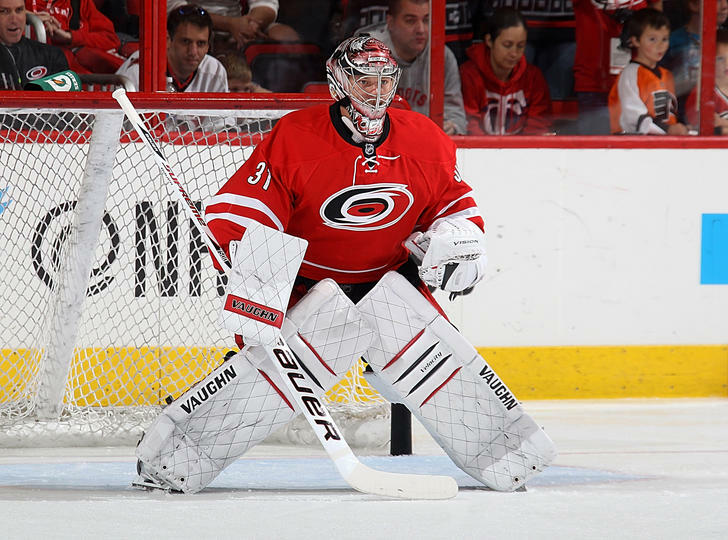 Still expect the Canes to trade Peters, but Khudobin could steal Wards job this go around. Not sure if the Canes will be happy with that because of how much Ward makes and the fact he's virtually a lock to stay with Carolina throughout the remainder of his contract. Ward. The most expensive backup. Dobby gets the start against Buffalo tonight. Might lock up that starting job. Now 6-0 as a Hurricanes with a career record of 20-5-1 lol. Bobrovsky! That was one of the best games I've ever been to. Bob is unreal. Bob had an outstanding game... Columbus is Carolina's kryptonite; we always struggle with them. Haha canes are one of the few teams in the east i don't hate. Mostly for that reason. Doby is absolutely our best goalie. Dude is amazing with his stick. Reflexes are great. Positioning is perfect the vast majority of the time. Has a knack for finding the puck at the last second when it comes through traffic. Last night, the goals he gave up were almost entirely on the play in front of him. Every goalie is going to let some through. All goalies play better when they're not having to keep the team in the game by themselves. Sad part is, we really didn't play bad. Bobrovsky was absolutely stellar for Columbus. Dude is no joke. We skated as hard as we have all year and just couldn't get the goals. Game SHOULD have been 2-0, but that last goal came due to us just being caught with our pants down and tired. Wide open look at an angle, and Doby likes stepping out on those. When Cam is healthy, I say throw him out there against the first weak opponent we have, hope he has a good game, and trade him. Get what we can get, because Doby is the future in net. There is no question there.